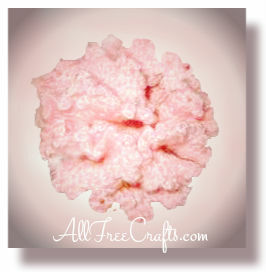 These lifelike frilly carnation flowers are quick and easy to crochet. I used yarn unraveled from an old baby sweater and I found it worked very well for this old pattern which my stepmother shared with me many years ago. The rapid addition of double crochet stitches in each round makes the pattern rather interesting because it forms the frills automatically as you work. Ch. 4 and join to form a ring. Row 1: Ch. 3, 17 dc in ring, join. Row 2: Ch. 3, 2 dc in each stitch all around, join. Row 3: Ch. 3, 3 dc in each stitch all around, join. Row 4: Ch. 3, 2 dc in each stitch all around, join. Ruffle: *Ch. 3, sc in next space. * Repeat from * all around, join. Very pretty, I recommended this pattern for a beginner who’s looking for a bit of a Challenge. but I was wondering how you attached the flowers to the sticks? And what kinds of sticks you used? Like this carnation, and am making it right now. Did you use doily thread and a crocheted doily crochet hook? Also when you are done don’t you have to form it to finish it off? I’m using cotton yarn sugar ‘n’ cream, so I think it will be too big so also wanted to know what ply you used. I’m using a size g crochet hook. I used baby weight yarn and 3mm steel hook. But it was quite a long time ago. I remember the carnations form themselves as you work; it’s quite amazing to see. Baby weight yarn and a 3 hook is what I saw on this pattern; however, years ago I made these and used crochet thread. We used to insert a stick pin in the center whole and then pulled a thread around it to form a flower pin.